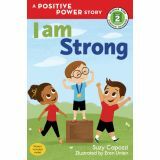 Short on words and long on empowerment, the Positive Power early reader series teaches kids and parents alike the power of positive affirmations and how to incorporate them into their daily lives. PreK-Grade 1. Paperback. 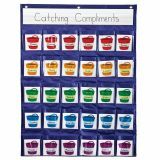 The playful and modern look of these Upcycle Style student incentive charts is perfect for rewarding children of all ages. Track progress as kids work towards a goal, exhibit good behavior, or complete tasks. 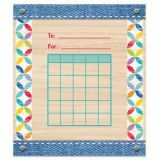 Great for chores, homework assignments, and to reinforce daily routines. The fun denim-like fabric combines with the colorful medallions and the realistic-looking rustic woodgrain for a design that is warm, friendly and inspiring. 5.25"x6". 36 per pack. 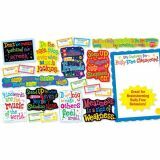 Encourage your students to take a stand against bullying with this community-building bulletin board set. 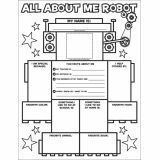 Includes a fill-in Class Contract so you can set a tone of friendship and cooperation in your classroom. Also includes 36 student pledge forms to remind students to stand up to bullying. 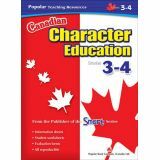 47 pieces includes: 10 anti-bullying accents, fill-in class contract (18"x24"), 36 student pledge forms and activity guide. 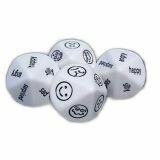 Each die comes in five facial expressions and five names of the expressions. ****Weird! **** Luisa is repeatedly teased and called "weird" by her classmate Sam. Luisa initially reacts to the bullying by withdrawing and hiding her colourful nature. 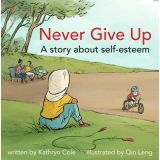 But with the support of her teachers, parents, classmates, and one special friend named Jayla, she is able to reclaim her colour and resist Sam's put-downs. PreK-Grade 4. Paperback. ****Tough! ****Sam teases her free spirited classmate Luisa and enlists a friend, Jayla, to help. 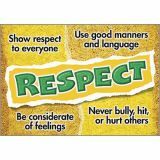 But when Sam is confronted by a concerned teacher about her bullying, and Jayla turns on Sam and befriends Luisa, Sam begins to show some heart and rethink her treatment of others. PreKGrade 4. Paperback. ****Dare! **** Sam is bullying Jayla's friend Luisa, and she enlists Jayla to participate. Jalya reluctantly joins in but soon realizes it is wrong. 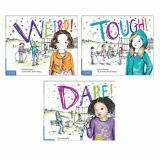 With the help of caring adults and friends, Jayla comes to sympathize with Luisa and fi nds the courage to dare to stand up to Sam. PreK-Grade 4. Paperback. Shaun is strong enough to know that even things that don't come easily can be mastered through determination and hard work. Learning to ride his two-wheeler with the help of his friend Nadia, he overcomes his fear and the teasing of the other children in the park and manages to impress friends and bullies alike. 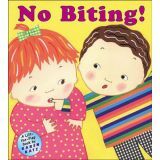 Even the most angelic babies sometimes hit or bite, and no one-not Mommy, or playmates, or even the family pet!-is exempt when the adorable, but frustratEducation, toddlers in No Biting! decide to act out. But just lift the flaps, and you'll discover that these babies know a better way to act after all. 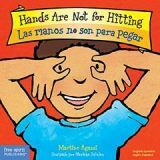 Refreshingly honest and all-too-true, this funny book is one that babies and parents will want to share again and again.